Last week, my husband and I made the trek from our home in Ohio to Fayetteville, North Carolina. We had originally intended to leave early in the day on Thursday but that was before the water heater decided to break and needed to be replaced. My husband spent several hours making the repair and by the time we got on the road it was late in the evening. We drove part of our nine-hour trip, through most of West Virginia, before we decided to stop for the night to van camp at a travel plaza. 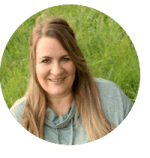 I’d purchased an eight -inch memory foam mattress which made our van camping experience very pleasant and believe it or not, comfortable. Though it was cold in WV and our windows quickly froze over, we were snug under our goose down comforter and slept well until morning. Van camping was a great way to kick off our weekend of soft adventure and it made my husband happy. Unfortunately, the weather didn’t want to cooperate during our stay so we weren’t able to spend as much time outside in Fayetteville as we’d hoped. The rain may have forced us to change our plans to hike and fish but that doesn’t mean we didn’t find stuff to do. There is so much to do in Fayetteville that I should have planned my visit when I had more time to spend in the area. Here are some of the things we did during our visit. Relatively new to the North Carolina State Park system, this property once belonged to James Stillman Rockefeller and his wife Nancy Campbell Sherlock Carnegie, descendants of two of America’s most well-known families. My husband and I enjoy home tours, especially when it involves prominent family’s in American history, so a stop at Carvers Creek State Park was a must. Long Valley Farm was the Rockefeller’s winter retreat and offered quiet and solitude not found in their primary residence located near NYC. 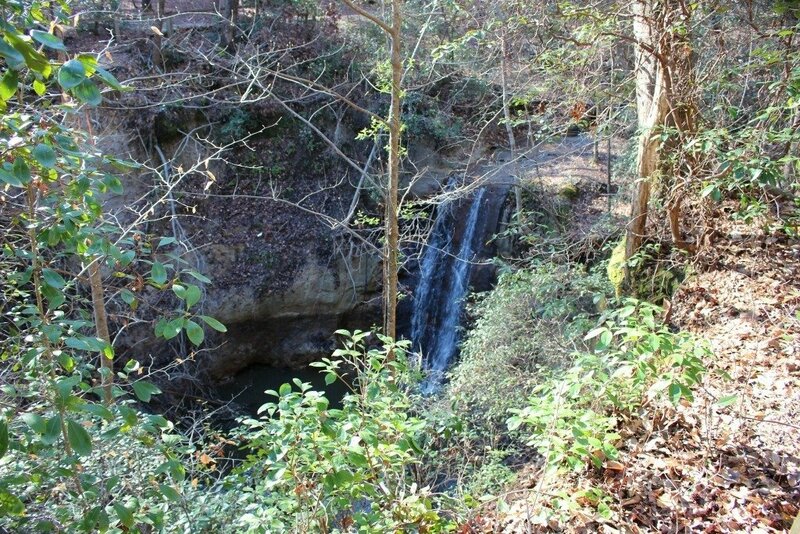 Rockefeller bequeathed the home and over 1,200 acres of land to the Nature Conservancy who offered the property to the North Carolina Park System in 2010. To reach the home, visitors must walk a sandy half-mile trail lined with pine trees that lead from the Park Office to the farm and millpond, the focal point of the park. The home is in disrepair and entry is permitted only on special ranger-led tours that must be scheduled in advance. Plans are made to restore the farmhouse and mill on the property. 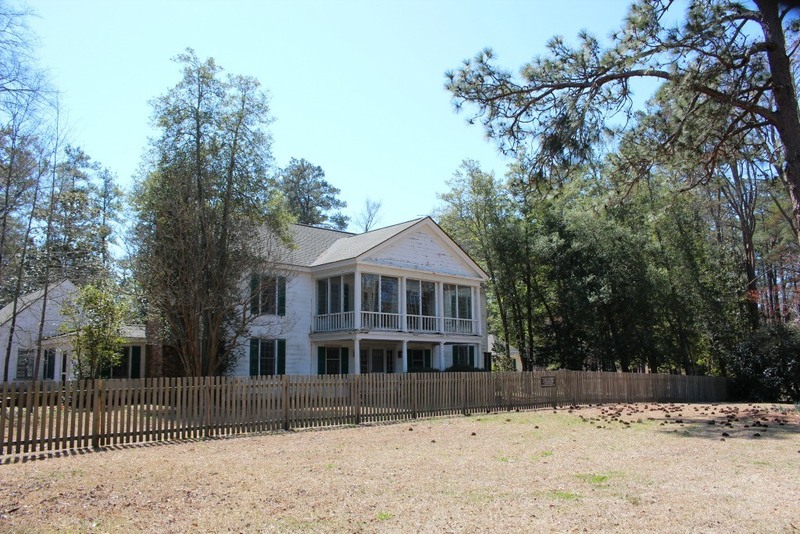 The millpond at the front of the house was damaged last fall when Hurricane Matthew swept through Fayetteville. Carvers Creek State Park is a popular birding trail and home to a variety of woodpeckers, including the federally endangered red- cockaded woodpecker. TIP: If you enjoy home tours, check the park website and plan to visit when you can tour the home. You’ll also see a lot of birds along this trail. 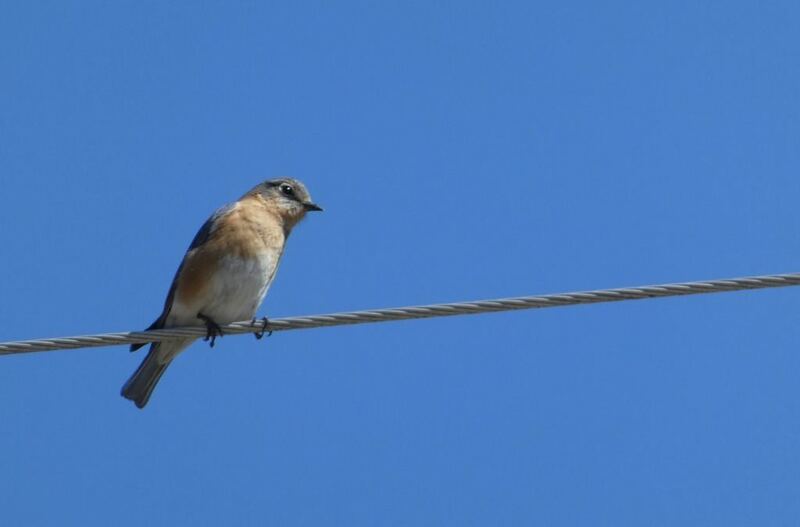 If you’re a birder make sure to pack your binoculars or telephoto lens for your camera. My middle child had planned to be a soldier since the time he was four-years-old. At nearly 22, he’s living his dream not as a soldier, but as an Air Guardsman. Because of his interest in the military, we often visited museums that pay homage to the men and women who have devoted their energy and lives to protecting the freedoms that we enjoy in America today. 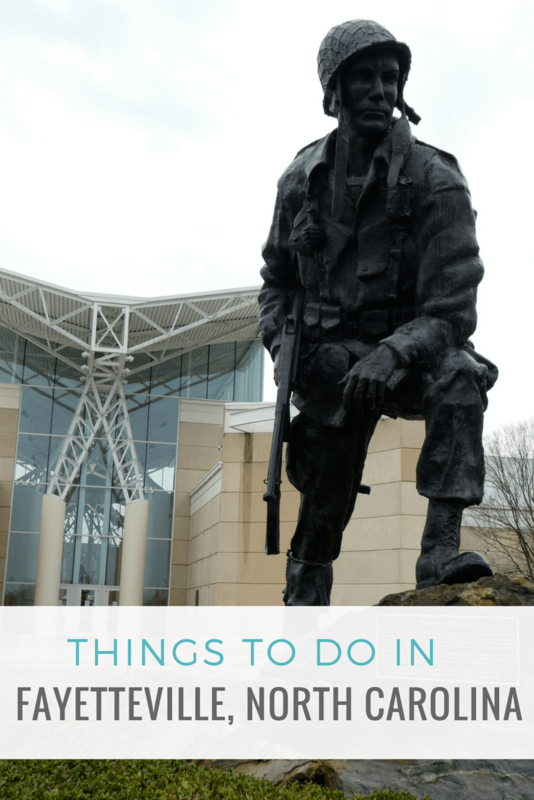 The Airborne & Special Operations Museum is one of the nicer museums that I’ve encountered in my travels and both my husband and I were surprised to see that admission is free. The museum features exhibits that share battles from WWII, Korea, and Vietnam, as well as those not as well known that have involved American troops. After touring the exhibit portion, we chose to purchase tickets for the pitch, roll and yaw motion simulator to experience airborne training. TIP: The simulator did make my husband queasy and he was happy when the short ride ended so if you’re particularly prone to motion sickness, take a Dramamine before you purchase your ticket, or sit this one out. Take note of the statues outside the museum as well. You can’t miss Iron Mike that reflects a WWII paratrooper and welcomes guests to the museum, but Constant Vigilance is the only memorial of its kind in the world. 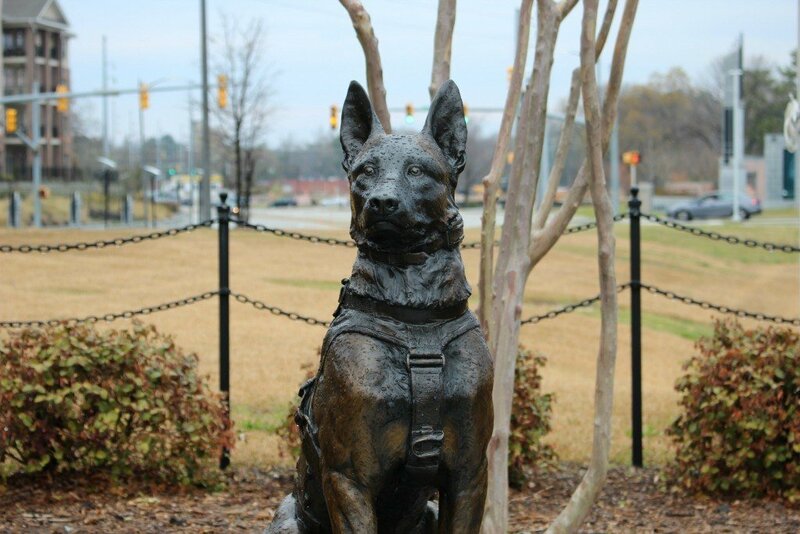 This bronze sculpture honors the service dogs that have fallen in the line of duty and you’ll see plaques honoring each of them in front of the memorial. 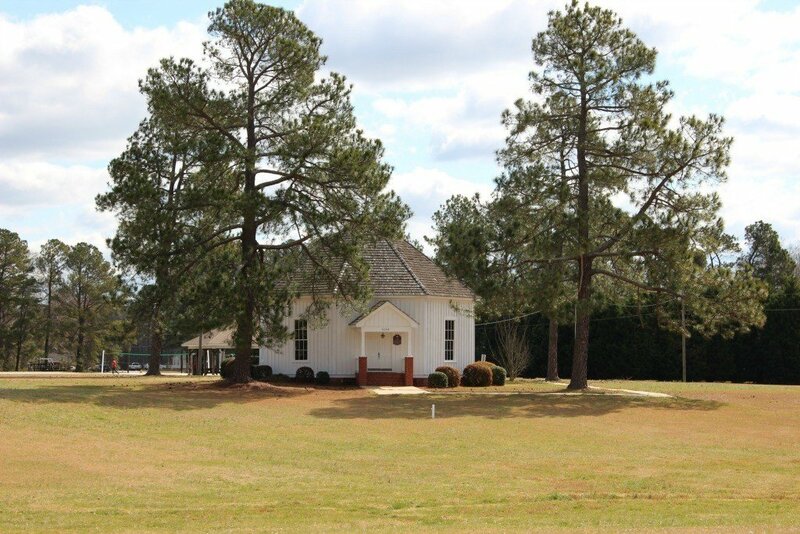 From here, you can take a quick walk across the road to the Freedom Memorial Park to see the memorials that honor Cumberland County’s war dead. Across the parking lot from the Airborne & Special Operations Museum, you’ll find the North Carolina Veteran’s Park which is a must stop. It’s also free. TIP: This museum appears to get very busy. Arrive early in the morning to avoid the majority of the crowds. 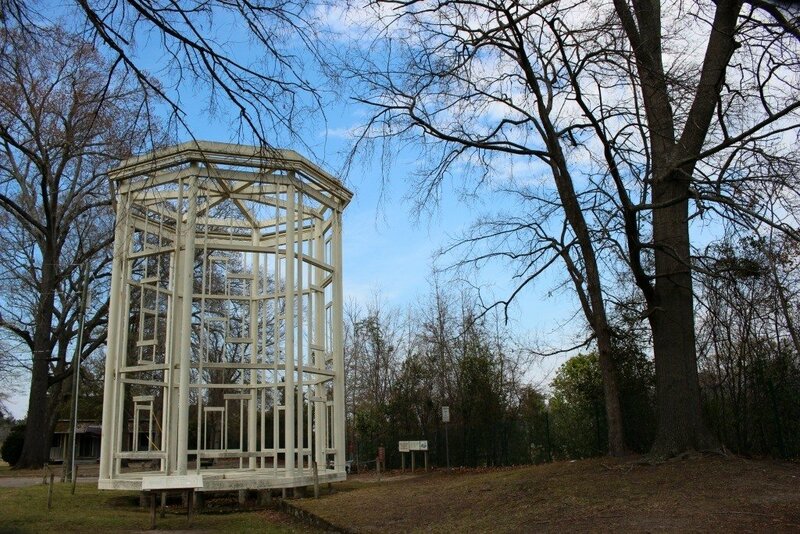 The Visitor Center is undergoing repairs due to the hurricane and was closed during my visit, but that shouldn’t stop anyone from strolling the grounds. This beautiful and solemn park recognizes every branch of the military through incredible and moving memorials. 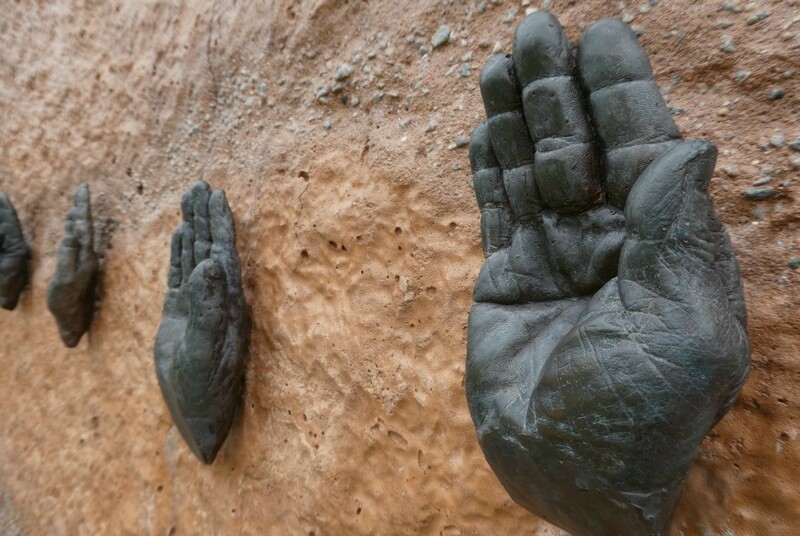 Highlights include bronze sculptures of the hands of over 100 veterans from North Carolina. If you peek through the window of the Visitor Center, you’ll catch a glimpse of the chandelier that is made of over 33,500 dog tags. 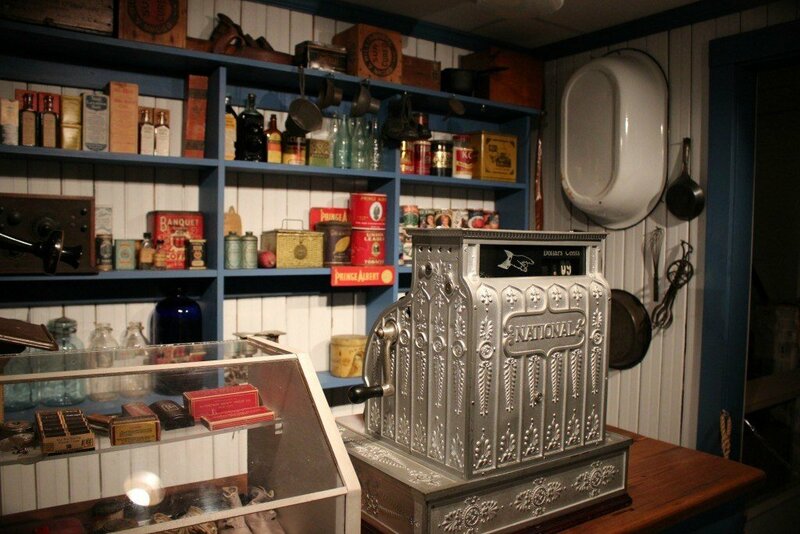 This area museum is housed in two buildings and you won’t want to miss either. 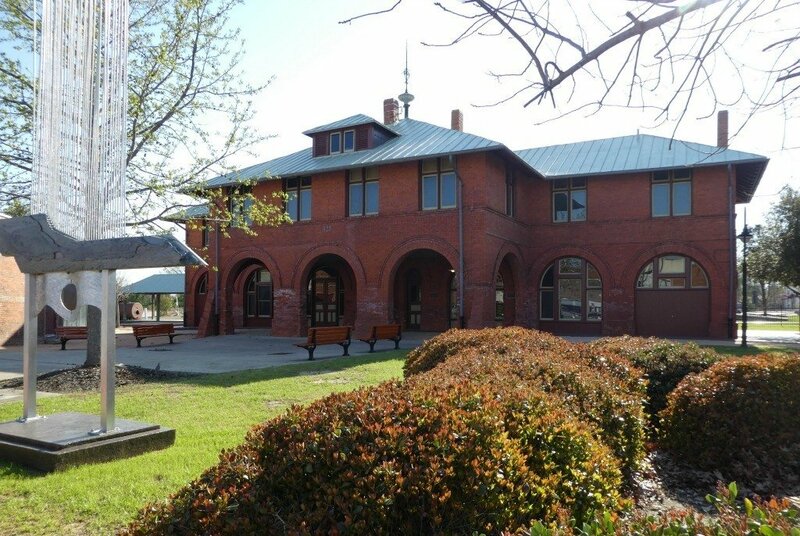 The main building, housed in a restored 1890 Cape Fear and Yadkin Valley Railroad Depot has two floors of exhibits that span from local history and an interactive steamboat exhibit to a temporary exhibit on death and dying. The annex next door highlights a 1920’s restored gas station and 1880’s steam pump engine. On Saturday mornings, you’ll find a farmer’s market outside the museum doors with pies, breads, teas and fresh produce when in season. 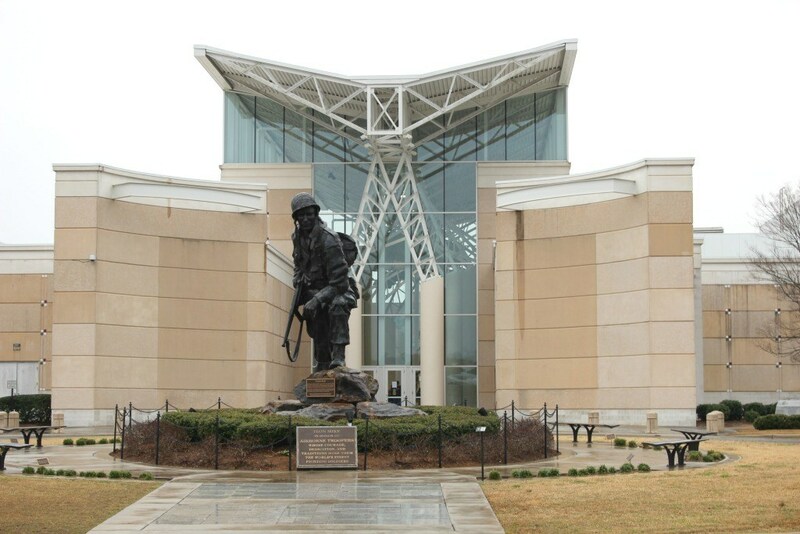 This museum complex includes the Cape Fear History Museum, the E.A. Poe Home, and Arsenal Park. 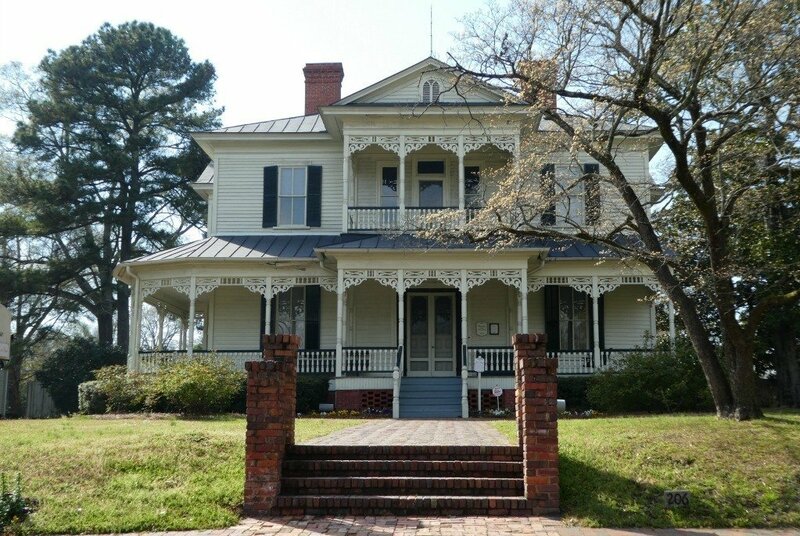 Visitors to this trio of properties will learn about the history of Fayetteville and North Carolina from Native American’s to post-Civil War. The child-friendly museum features interactive displays and exhibits. Highlights in the museum include a Civil War field tent that kids can climb inside, a recreated general store and steamboat. Museum docents lead guided tours of the 1897 Poe House that is located next to the museum. This property is listed on the National Register of Historic Places and you’ll find some of the Victorian period furnishings are original to the home. The owner of the home, Edgar Allen Poe, is not the famous poet, but rather a prominent businessman. The four-acre Arsenal Park can be accessed by a foot bridge behind the property that crosses the highway. 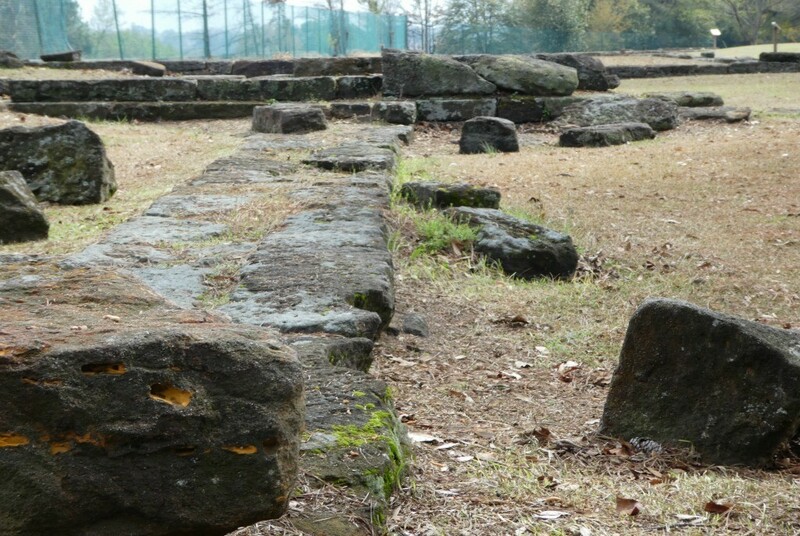 You’ll see remnants of the US Arsenal that was built in 1836 to store arms and destroyed by General Sherman during the Civil War. TIP: If you plan to tour the 1897 Poe House, make sure to view the tour schedule prior to your arrival. Limited tours are offered during the week and on weekends. Our visit coincided with the Cape Fear Wildlife Expo so we stopped by to see what it was all about. We found a variety of exhibits from local parks to state wildlife agencies, to vendors selling anything from jewelry made of bullets (that were so cool), to custom handmade knives, to jacked up Polaris Razors and RV’s. My favorite exhibit was that of a collector who shared his collection of Bomber fishing lures. Spanning from the first handmade wood carved lures to the more modern plastic lures, his collection was rather fascinating. My husband and I had planned to fish at Lake Rim Park, where you can even borrow fishing equipment to use, but we scrapped those plans due to the rain. Fayetteville offers more than 750 miles of themed driving trails that range from historic architecture to adventure trails to international cuisine. My husband and I opted to do several of the trails, starting with the Historic Architecture Trail that covers 55 miles. Suggested time to complete the trail is half a day but it only took us a couple hours. The trial covers the oldest residential areas and features a wide variety of architectural styles. Favorites on this trail included the Market House (which is the focal point of downtown), the 1897 Poe House, and the historic Haymont Homes. Few homes are open to the public for viewing, as most are private residences, law offices or other businesses but if you plan ahead, there are a couple that are open by appointment only. We found that many of the trails overlapped and in addition to the Historic Architecture Trail, we saw most of the Gaelic Beginnings Trail, Lafayette Trail, and Religious Freedom Trail. As a history buff, I would love to return to explore all the remaining trails. TIP: If you plan to tour several of these trails, pick up a cultural trail booklet at the Visitor’s Center or print it out from the Fayetteville NC Trails website prior to your arrival. Use the included maps to combine trails. We did take time on Sunday before heading home to stop by Clark Park which is at the end of the Cape Fear River Trail. The Visitor Center was closed upon our arrival, but we did follow the trail to some of the viewing areas overlooking the Cape Fear River. We also spotted a covered bridge and waterfall right behind the Visitor Center. If you’re in the area, this short hike is a must. 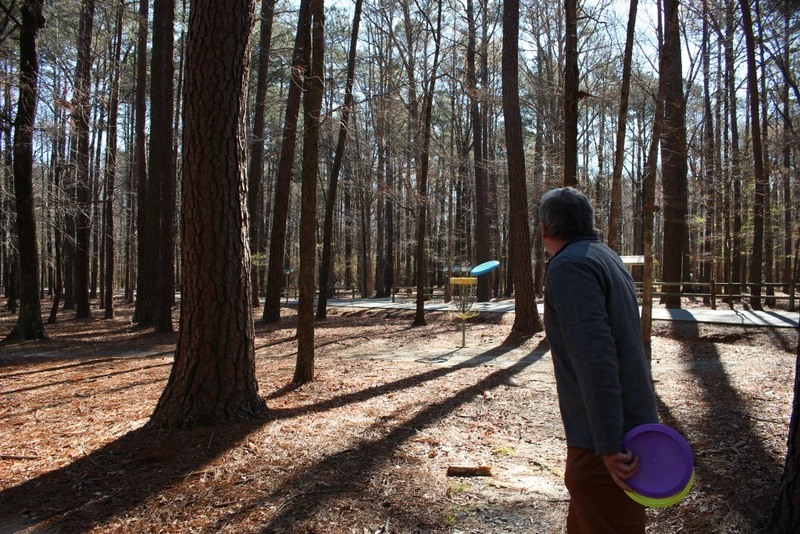 We did fit in a round of disc golf at Arnette Park before heading home. We discovered that disc golf is much more difficult than we thought it would be and that we really need to spend some time practicing before our second attempt (to reduce future risk of embarrassment). Arnette Park is a beautiful park with tennis courts, a ball field, playground, jogging and walking paths, and great picnic areas. I wanted some good southern eats while in Fayetteville so Melody, at the Visitor Center suggested, Fred Chasen’s Grandsons Restaurant. The buffet has locations in Hope Mills and on Ramsey Street in Fayetteville. We opted for the Ramsey Street location which was celebrating its Grand Opening at that location. Though busy, we were seated quickly. The food was southern style comfort food and I left with my belly full of liver and onions, boiled potatoes and white lima beans while my husband opted more for the Chasen’s specialty Fried Chicken. John, a volunteer from the Airborne & Special Operations Museum, suggested we try the Huske Hardware House. Once a hardware store, now turned brewery, this gastropub is housed in the 112-year old building and offers up great food and service. I ordered the Firkin Burger as I’ve found burgers and steaks to be a pretty safe bet when dining in a brewery. I was not disappointed and neither was my husband who had ordered the UK inspired Bangers & Mash. I don’t know when it started, but it appears donuts have become our staple road trip indulgence. I googled best donuts in Fayetteville and Duck Donuts popped up so we decided we’d give them a try. Duck Donuts are made to order as you wait. The vanilla cake donut is fried in front of your eyes and then topped with your choice of toppings. My husband opted for donuts with chocolate sprinkles and crushed Oreos, while I preferred a simple cinnamon topping and one with maple and bacon. I had originally hoped to stay in a cabin at the Fayetteville RV Resort & Cottages but the cabins were sold out for the dates we needed. We ended up at the Baymont Inn and Suites. This is an older property that has recently been renovated. 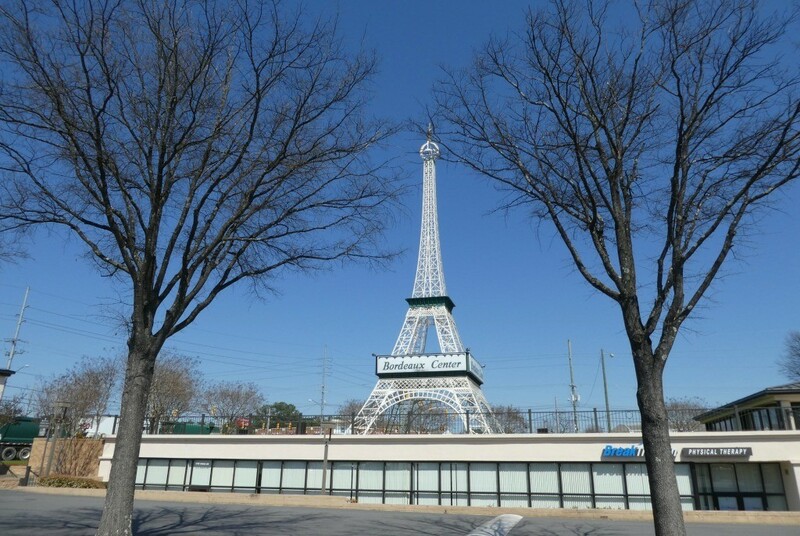 Our room overlooked the parking area and afforded us a view of the Eiffel Tour roadside attraction across the street. While our room was nice, the property was a bit noisy as we could hear those in the hallways better than I would have liked. I was blown away by how quaint and cute historic downtown Fayetteville is. 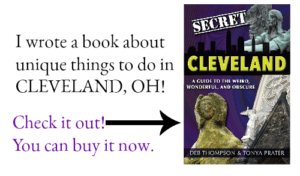 With amazing historic buildings, lots of public art, food trucks and interesting boutiques and shops, I found myself wishing I’d planned to spend more time in the downtown area. One could easily spend a full day shopping, taking photos and eating. 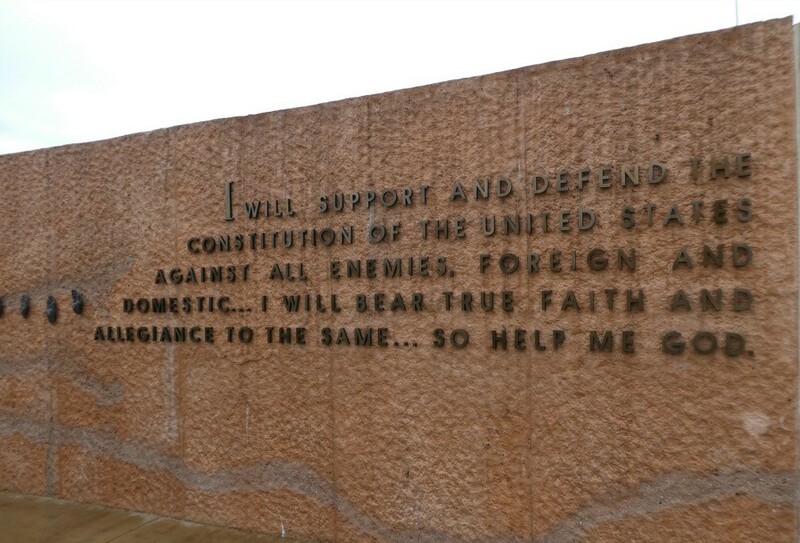 My husband and I enjoyed the cultural driving tours and would love to explore more of the remaining trails- especially the American Independence and Patriots Past & Present which lead visitors to Fort Bragg, the nation’s largest military base. Next time, I’d like to spend more time outdoors as I had hoped to do on this trip. I’d hike on the Cape River Trail, stroll the grounds of the Cape Fear Botanical Garden, go fishing at Rim Lake, and possibly consider zip lining at ZipQuest. There is so much to see and do in Fayetteville, North Carolina that we really underestimated how much time we would need to explore. Stop by the Fayetteville Visitor’s Center or use their website to plan your trip. While I could have easily printed the heritage trails from my computer, I preferred to stop by the Visitor Center and pick up a printed copy that includes all 17 trails. This was perfect for our rainy day, as we could drive through the area and learn about the history from our vehicle. Plan your trip, but then ask the locals for recommendations. I learned where to go, what to eat and what not to miss in the community from John, a volunteer at the Airborne & Special Operations Museum. Talk to people. You’ll find many veterans’ and other people heavily connected to the community throughout Fayetteville who have an amazing story to tell. I spoke with one of the volunteers at the Transportation Museum who shared the journey that brought him and his wife to the area just over ten years ago. Retired from the Navy, he’s heavily involved in the community and until the hurricane last fall worked at the Veteran’s Memorial. Travel becomes so much more meaningful when you connect with the area you’re visiting on a personal level. From the moment we reached Fayetteville, I was treated like I was a friend and not simply a tourist. My husband and I spoke with several members of the community that truly made us feel welcome and enhanced our visit. 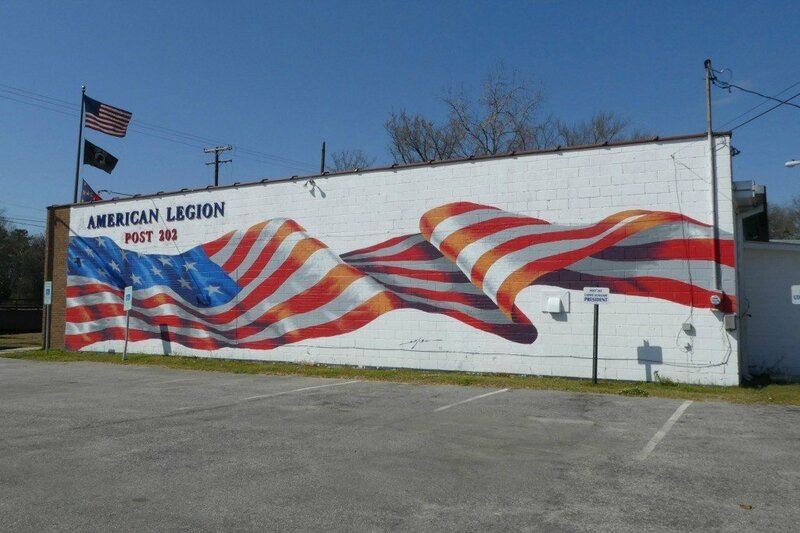 As you can imagine from a military town, Fayetteville is very patriotic, as a military mom, I thought it was fantastic, but if you’re not a supporter of our military, you may find an alternate destination a better fit for you. I hope I’ve piqued your interest in this all-American town, you can learn more and plan your own visit when you check out all the attractions you’ll find in Fayetteville. You can also stay up to date with the happenings in and around Fayetteville on Facebook, Instagram, Twitter, and YouTube. 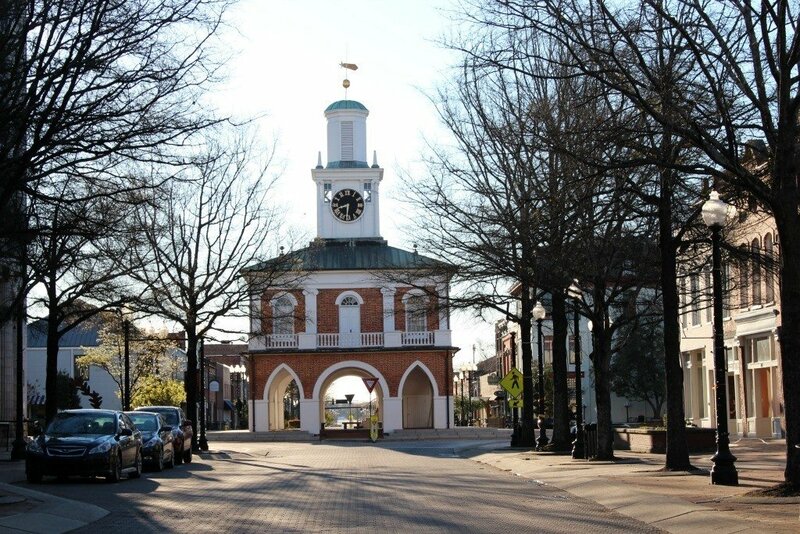 What would you love to do in Fayetteville, North Carolina? This is a sponsored conversation written by me on behalf of Visit NC. The opinions and text are all mine. The pitch, roll and yaw motion simulator sounds very exciting and interactive. Sorry to hear that your husband felt queasy. What was it like?! 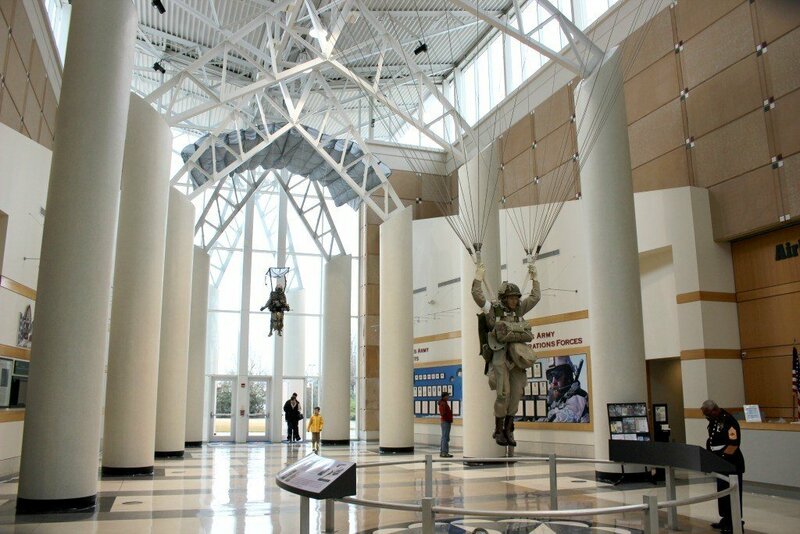 I served in the Army, so I think it would be a great experience to visit Fayetteville and check out the Airborne & Special Operations Museum. I always like to visit these kinds of military museums when I visit a new city. 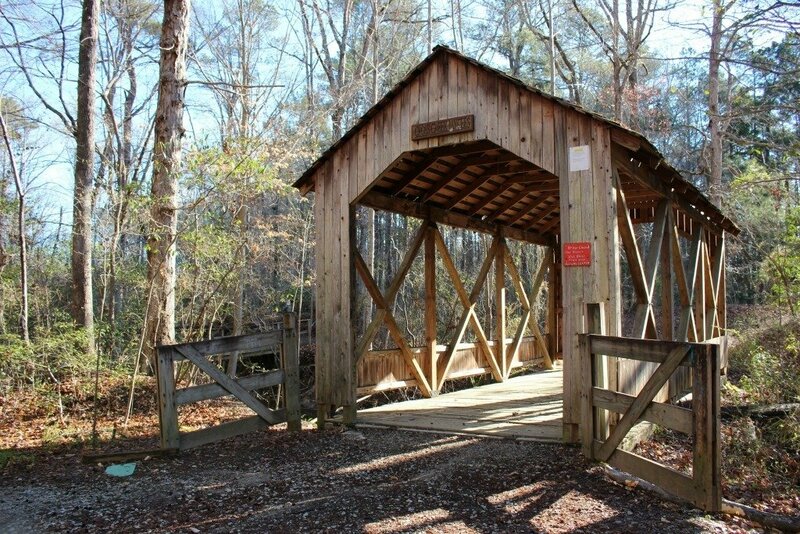 Love that different looking covered bridge! Fayetteville is so rustic. Love that you include Veterans park. Thank you for honoring our men and women. The dogtags trigger such deep feelings for people who have men and women who have served in our families.